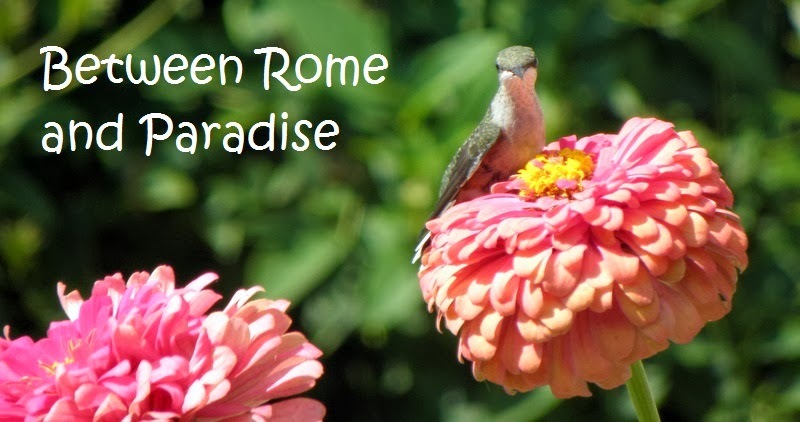 Between Rome and Paradise: I still knit. Really. Not that long ago, it was common for me to knit ten or so pairs of socks a year. This year: two, maybe three. What am I doing instead? I'm working less (and my supervisor won't let me knit during meetings anymore), but I am also exercising more, spending time with my granddaughter, binge watching entire seasons of "The Good Wife" and "Damages", taking up new hobbies, yardening, etc. The days are just packed. I did manage to finish a pair of socks recently, though. Yarn: Zwerger Garn Opal Surprise in colorway 4067 (would you call that "Camouflage" or "Autumn in New England"? Modifications: Abbreviated the repeat when I got to the leg to eliminate columns of double-purl stitches up each side. At least, I think that is what I did. I've been diligently concentrating on learning to knit socks from the toe up instead of top down, thinking there would be less worry about running out of yarn. But the toe-up socks I have knit seem to use up more yarn than the top-down ones. In fact, this time I nearly ran out of yarn before the tops were a decent length. This yarn shortage may be because usually I knit ribbed patterns that allow me to put some negative ease into the socks, whereas the toe-up patterns I chose are not ribbed and have no ease. In fact, they are a bit loose. So for my next pair, I chose a ribbed pattern. We'll see how they work out. But your socks look great.